Best Photobomb Ever? Little Boy takes all the Attention & We’re Loving It! 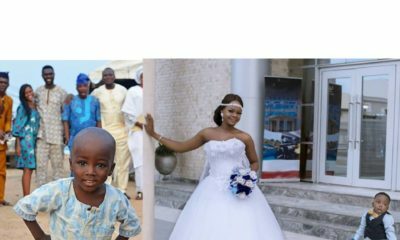 It’s so adorable, how this little boy just stands in the between a photographer – Ayaworan Media House – and people posing to have their photo taken. And his smile, his smile, him standing there with his hands on his waist, smiling. ? Someone called it the best photobomb ever. We’re inclined to agree. Awww…such a fine lil man. Look at his composure and matured smile! Truly the best photobomb ever! Totally made my day, you can’t help but smile. Cute lil dude with a heartwarming smile. God bless and keep him, amen. ?? And the reaction of the wedding party…epic! Exactly. Nigerians always bring the “money” angle to everything. He is a handsome boy in his play clothes. How do you know he is poor and that we are “looking down” on him. Omg! Exactly! I didn’t understand the need for “don’t look down on anyone no matter how they are dressed” what in the world? Lmao!!! That “no one knows tomorrow” line is so disturbing. And it’s always laced with the person being the president or someone powerful. So what happens if they become just regular, do we still respect them or do we withhold respect? The pose gaan no be for hereeeeee…… saw it on Instagram yesterday couldn’t help but laugh………….. I don’t believe that this isn’t fake. The poses of the people in the the background look faked to me. And the kid who “photobombed” appears to be in focus, instead of the people who were actually meant to be photographed. Plus the very very random lesson? ?